The Epic Crossover Event of East Meets West! 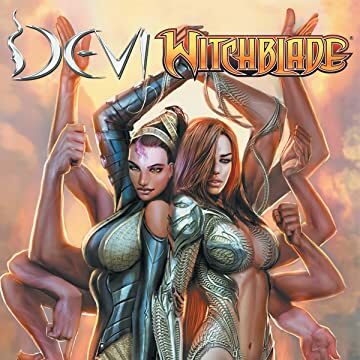 When a murder investigation takes her to India, NYPD Detective Sara Pezzini, the bearer of the mystical Witchblade, crosses paths with Devi, goddess incarnate and protector of Sitapur, in the first-ever crossover of these two female warriors! If they can survive their initial meeting, the two women will confront a powerful common enemy, and discover that this is not the first time an incarnation of Devi and a bearer of the Witchblade have met. From the powerhouse team of Ron Marz (Witchblade, First Born), Samit Basu (Devi, Turbulence), Mukesh Singh (Devi, Dinosaurs Vs. Aliens) and Eric Basaldua (The Darkness, Hunter-Killer).